Welcome summer with these printable summer activities for kids. 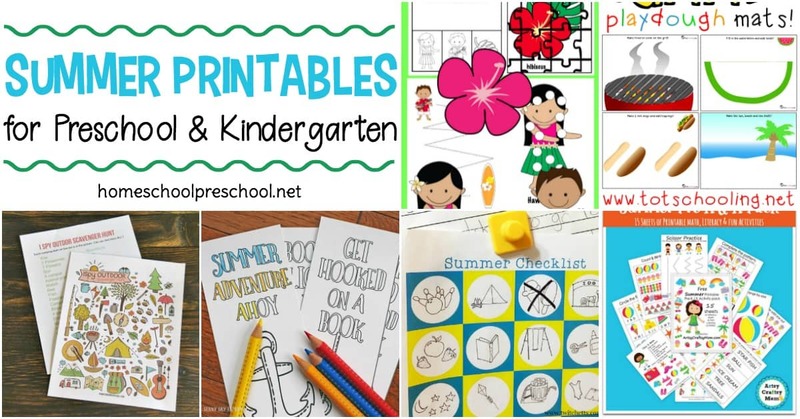 From coloring pages and scavenger hunts to flash cards and book logs, we’ve got all you need for preschool summer fun! Summer is the perfect time to reinforce preschool skills, introduce new ones, and mix it up with TONS of summer fun. The activities featured below, are a mix of summer activities and summer learning. I can’t wait to hear which one of these summer printables you try first. Let me know in the comments below. • This Summer PreK & K Pack contains 15 sheets of printable math, literacy, and fun activities for young learners. • Get your young readers off to a great reading start with this set of free printable summer sight word flashcards. • You and your preschoolers can spend the summer trying to fill out this Nature A-Z Scavenger Hunt page on your nature walks. • Whether you have plans to actually go camping or you are working on a camping theme with your preschoolers, don’t miss this I Spy Outdoor Scavenger Hunt. 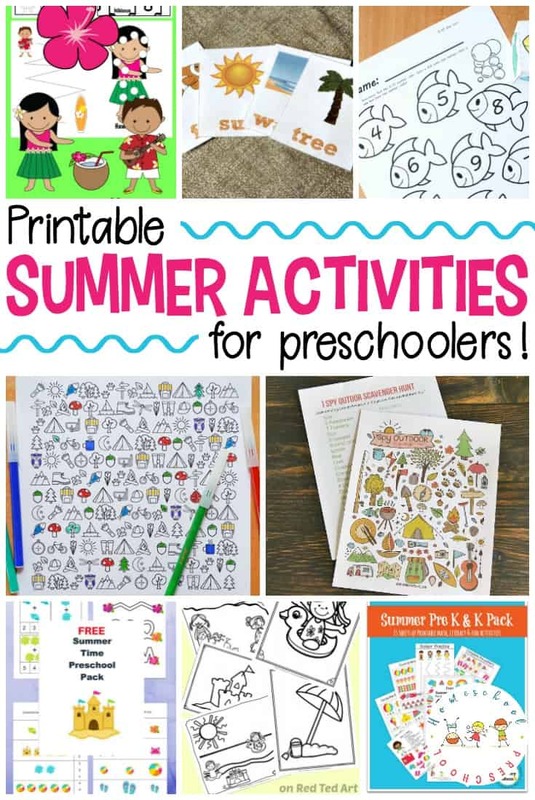 • If you need an activity to keep your kiddos busy for a few minutes, print out this free summer-themed find and color activity page. • Kids will enjoy working on number recognition and counting as they complete this Roll and Color Summer Math Game. • I love reading logs that encourage kids to read different genres of books. This book log is perfect for a summer reading challenge. 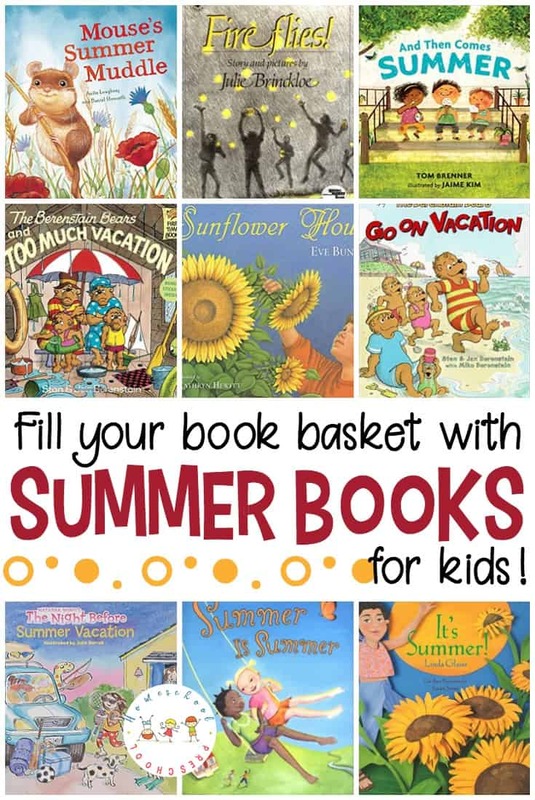 • Print out these summer reading bookmarks to go along with the summer reading logs linked above. • These summer do-a-dot printables will help your preschoolers get ready for some fun in the sun! • Outdoor scavenger hunts are great for sending kids on a sensory hunt. This printable encourages kids to search for and sketch objects that fit numerous sensory categories. 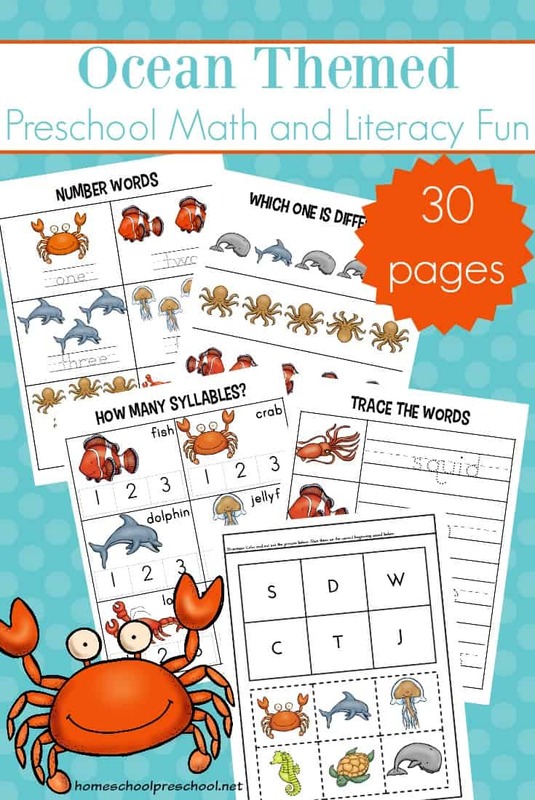 • Check out these FREE preschool ocean theme printables! These printables will help kids learn colors, alphabet, and math with a fun ocean theme. Perfect for your summer homeschool preschool lessons! • Preschoolers can work on number sense this summer with this free summer number names printable matching game. • This summer printable pack for preschoolers focuses on sizing, counting, addition, prewriting, and letter recognition with a fun summer theme. • I love sunflowers. They’re brilliant color and large size fascinates my kids and me. Kids can work on counting to ten with these set of sunflower counting worksheets this summer. • Take your kids on a Five Senses Walk this summer. Kids will love drawing what they see, hear, touch, smell, and taste on their walk. • This summer fun bingo isn’t like a regular bingo game. Instead of covering squares in a quick game of Bingo, your kids will cover the squares as they go on adventures throughout the summer months. • I always loved color-by-numbers when I was a kid. Even if I could tell what the picture was before I started, I loved watching the picture come to life. 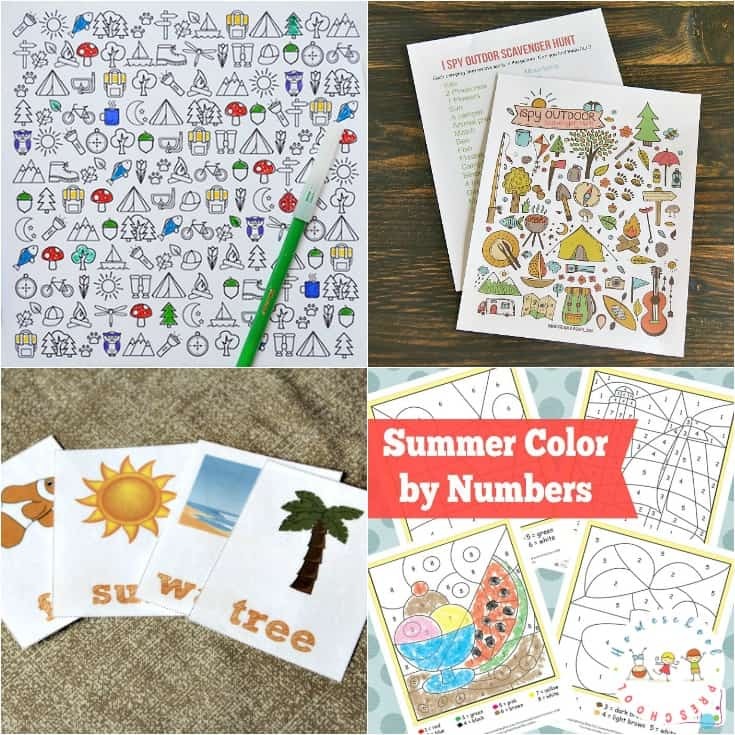 Your preschoolers will love these summer color-by-number worksheets. They’re perfect for a rainy summer afternoon. 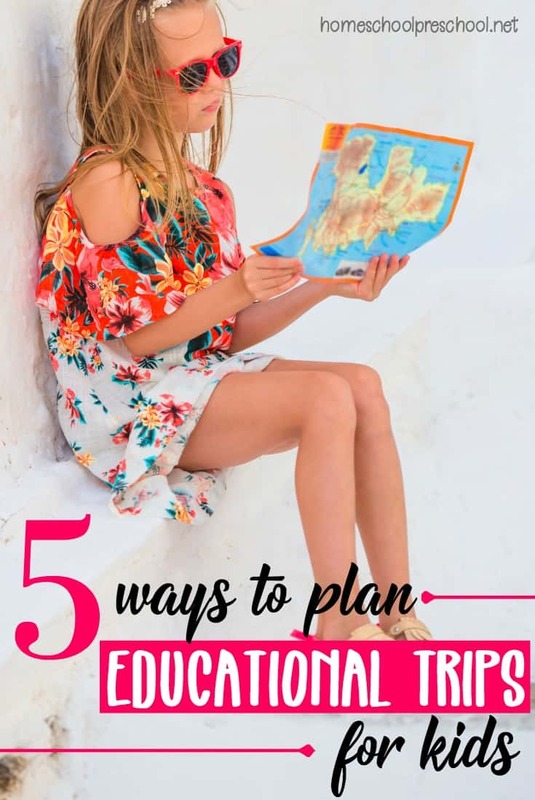 • Use this summer checklist to make memories with your kids. Get outside. Play, swim, and explore this summer. Color the pictures as you complete each activity. • Our new house is across the street from a nice city playground. I can’t wait to take my grandson there. When he’s a little older, I’m going to print out this playground scavenger hunt activity to do with him. • Can you and your preschoolers come up with fun summer activities to complete this summer fun alphabet? • Uh oh! It’s raining outside. Now what are you going to do? Grab some playdough, and let your kids play with these summer playdough mats. • These beach coloring pages are perfect for summer. Whether you use these as car activities on your way to the beach or you use them as a fun summer afternoon activity, your kids will enjoy all five. • Summer is a great time to go camping. Let your little ones work on fine motor skills as they work their way through these camping-themed do-a-dot printables. • Here’s another fun summer camp out printable that is full of fun learning activities for your little ones. Each of the camp out and s’mores themed activity page is sure to engage your preschoolers. • Check out these Hawaiian Luau activity pages! There are 20 fun summer activities for kids in this free pack. With so many fun summer activities for kids, where will you begin?